„Kabile“ takes its name from the village Kabile where the members of this extraordinary group of musicians played one of their early gigs together; a small village located just north of the city of Yambol in Thrace. This particular group of musicians played together for about 10 years from the mid 1980’s to the early 1990’s and were so popular that they hardly ever had a free weekend. Weddings, Subors(village or county fairs), National Holidays, Religious Holidays, Christenings, Festivals, etc ….. all were the domain of this much in demand group of superbly talented musicians. IVAN HANDZHIEV (vocals, accordions) is a native of the village of Lesovo in the Yambol region of Thrace. He began singing as a small child with his mother and other village singers and started playing accordion at age 9. He attended the Philip Koutev Secondary School in Kotel, then went on to the Plovdiv Conservatory. Ivan is a master of the ornamentation and improvisation technique unique to the Thracian style and has been on the faculty of the Philip Koutev Secondary Music School for over 25 years. NIKOLAY DOKTOROV (kaval) is from Varna on the Black Sea coast. He is a graduate of the Philip Koutev Secondary Music School in Kotel and the Plovdiv Academy of Music, Dance and Fine Arts. He has performed with the „Ensembl Trakiya“ in Plovdiv, the Horovod Ensemble in Varna, and is the director of the folk music orchestra Spectar from the Culture House of the Blind People – Varna. Nikolay is also the conductor of several regional folk ensembles and is currently on the staff of the “Anton Strashimirov” (post-secondary) High School and National High School of Arts – Varna. DZHENKO ANDREEV (gajda) is a gajda player from the village of Hanovo in the Yambol region of Thrace. As a boy, he studied with local teachers and later attended the Philip Koutev Music High School in Kotel, where he developed his Thracian style. Specializing in the traditional melodies from his village, Dzhenko has been a soloist with the Sliven Ensemble, and has performed with them in Bulgaria and abroad for over 25 years. NIKOLAI KOLEV (gadulka), a native of Karavelovo in Bulgarian Thrace, has been playing gadulka since age 10. After graduating from the music high school in Shiroka Luka, he has performed constantly, first as soloist of the Sliven Ensemble for Folk Songs and Dances. 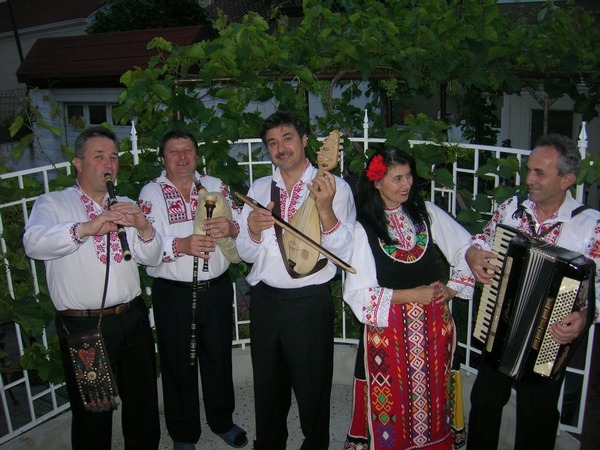 In 1985 Nikolai formed the folk music ensemble Rozova Dolina, and in 1992 he founded the prize-winning ensemble Balkanski Glasove. Nikolai has accompanied many well-known singers, including Vulkana Stojanova, Roumen Rodopski, Nedyalka Keranova and Todor Kozhuharov. DONKA KOLEVA (vocals) is a native of the village of Tuzha in the Stara Zagora region of Bulgarian Thrace. She graduated from the Musical Folklore High School in Shiroka Luka, and performed for three years with the Sliven Folk Dance and Music Ensemble. She was the director of the Folk Song Chorus of Sopot, has been a featured soloist on Bulgarian Radio-TV. Donka has participated in many singing competitions in Bulgaria and Europe. Donka’s voice has been featured on numerous recordings, and in 1997, her recording of „Javore“ was named „Song of the Year“ in the Bulgarian national radio competition.